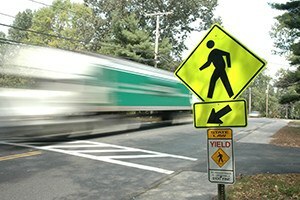 What Compensation is Available in Pedestrian Injury and Death Cases? Just like other car crash cases, pedestrians injured due to motor vehicle driver negligence are entitled to recover the cost of medical bills, lost earnings, and pain, suffering, and disability damages. In wrongful death cases, certain family members are generally entitled to damages for the loss of their loved one, as well as loss of financial support. For more information on personal injury damages, click here. For more information on wrongful death damages, click here. Usually, drivers have liability insurance, and compensation for pedestrian injuries and death is obtained through the driver’s auto insurance company. Once the extent of the damages is clear (usually when the claimant completes of is nearing the end of medical treatment), the value of a claim can be determined and the parties begin negotiating settlement. Generally there is an insurance adjuster assigned to the case early on who handles negotiations on behalf of the liability insurance company. Adjusters are trained to downplay and minimize the extent of the harm, to try to save the insurance company money. Without an experienced personal injury lawyer, claimants are often pressured into a quick settlement compensating only a fraction of their true damages. Before accepting any settlement, we recommend that you consult with an experienced personal injury attorney. In pedestrian injury cases, sometimes the driver’s insurance policy is insufficient to cover the full extent of damages, and sometimes drivers have no auto insurance. In these situations, the injured pedestrian may be entitled to additional recovery under his or her own underinsured motorist (UIM) policy. UIM coverage comes into play when the value of a claim exceeds the value of the at-fault driver’s liability insurance policy. It is important to note that there are certain procedural rules that must be followed in asserting a UIM claim, and failure to follow these rules may result in loss of coverage. A qualified personal injury attorney will know what to do to avoid these pitfalls, as well as how to determine if any other insurance coverage is available (such as through the driver’s home owner’s insurance or umbrella coverage). How are Medical Bills Covered While the Claim is Pending? Due to the severity of harm in pedestrian injury cases, claimants often find it difficult or impossible to bear the cost of medical expenses. Just like in car crash cases, pedestrian injury cases trigger personal injury protection (PIP) coverage under the applicable auto insurance policies. PIP coverage is a no-fault benefit through auto insurance that covers medical expenses, as well as portions of an injured person’s wage loss. Since PIP is a no-fault benefit, you are entitled to coverage regardless of who was at fault for the incident. In Washington, PIP is applied differently in pedestrian injury cases as opposed to other car crash cases. In car crash cases, those injured are normally entitled to PIP coverage under their own auto insurance policy and/or the auto insurance policy applicable to the car they are riding in—not under the other driver’s insurance policy. In contrast, pedestrians hit by cars are entitled to PIP benefits under the driver’s insurance policy. This protects pedestrians who may not have their own PIP coverage, such as those who do not own a car and thus do not have auto insurance. In pedestrian injury cases, the driver’s PIP policy is considered primary, meaning that is the first fund used to pay for medical bills. Once the driver’s PIP is used up (or if the driver does not have PIP coverage), then the pedestrian’s own PIP kicks in as the secondary source of coverage. This is one example where you may have rights under your auto insurance policy even though you were not driving your car. If you use up the entirety of all PIP coverage under both policies, then health insurance is the final source of coverage.